Although more commonly used in cooking ingredient, coriander actually has many health benefits. Coriander is indeed known for its efficacy in healthy digestion. Coriander has the Latin name Coriandrum sativum L. Coriander is one of the spices that very well known in the world. The aroma and taste of coriander is very distinctive and can flavor dishes, but not too sharp on the tongue. Active component of coriander are numerous, such as sabinene, myrcene, linalool, dekanal, and much more. These components cause the coriander has various benefits, such as relieving dizziness, vomiting, influenza, hemorrhoids, stomach ulcers and inflammation of the breast, measles, colds, high blood pressure and impotence. The use of coriander can be done by way of finely ground and boiled. For external treatment, coriander usually crushed and made into dough with water and mixed with other ingredients. The dough is placed on the affected part. In this way, include performed on the flatulence treatment and headache. 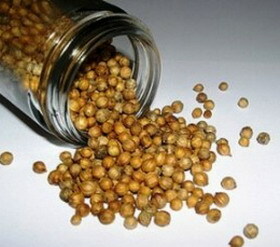 For the treatment of disease, coriander usually boiled with other ingredients. Filtered boiled water and drink regularly. This method is used to increase breast milk, treatment of vomiting, stomach ulcers, hypertension (plus celery), influenza (plus ginger, garlic and honey leaf), cough (plus cinnamon, cat whiskers, and palm sugar). A variety of acid compounds contained in coriander, linoleic acid, oleic acid, palmitic acid, stearic acid and ascorbic acid are known to be effective in lowering cholesterol levels in the blood. In addition, these compounds are also known to reduce cholesterol deposits in the arteries and veins. The content of iron in the coriander can help in overcoming anemia. The essential oil content varies in coriander can assist in the secretion of enzymes and digestive fluids in the stomach. In addition, it can also stimulate the digestive process by increasing peristaltic movements in the digestive tract. The essential oils in coriander also helps in overcoming anorexia. The content of cineole, which is one of 11 components of essential oils, and linoleic acid contained in the coriander has antirheumatic properties and anti-arthritis, the two properties are the reason that coriander can be used to treat swelling caused by rheumatism and arthritis. Coriander naturally stimulates the secretion of hormones and helps order of the endocrine glands, making it useful in maintaining order and reducing menstrual pain that may arise. The content of antioxidants, vitamin A, vitamin C and minerals like phosphorus in the essential oils coriander efficacious in maintaining the youthfulness of the eye, keep the eye from mascular degeneration and soothe the eye against stress caused by fatigue. In addition, the content of antimicrobials in coriander is also beneficial in helping to overcome conjunctivitis. Coriander is also efficacious in dealing with eczema, dry skin and fungal infection of the skin. Stimulatory effects of cumin, coriander contained in, the endocrine gland increases the secretion of insulin from the pancreas. This course will assist in converting sugars into glycogen and eventually high blood sugar levels can go down to normal levels. The efficacy is very beneficial for people with diabetes. to treat inflammation or inflammation, spasm, expectorant, protects the liver, anticarcinogenic, anticonvulsants, antihistamines, and hypnotics. Furthermore, coriander is also believed to act as a natural afrodisiaka when combined with other herbaceous plants.